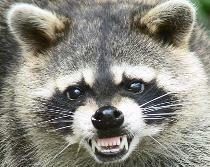 Which Animals Have Been Reported With Rabies in Florida? What do I do to protect myself, my family and my pets from rabies? Animals with rabies may show strange behavior -- they can be aggressive, attacking for no apparent reason, or act very tame (especially wild animals). They may not be able to eat, drink or swallow. They may drool because they cannot swallow their saliva. They may stagger or become paralyzed. Eventually they will die. Control bleeding and wash the area of the bite with soap and water. Report the bite to your local county health department, animal control agency, or police. Have your veterinarian vaccinate all of your dogs, cats, ferrets and horses against rabies, and make sure you follow your veterinarian’s instructions for revaccination. Never feed wild or stray animals—avoid attracting them with outdoor food sources (like uncovered trash). Feed your pets indoors. Support animal control in your community. Children should never approach or play with dogs unless supervised by an adult. Children should tell an adult if they see a stray dog or a dog acting strangely. Adults should never leave an infant or young child alone with any dog, not even the family pet. sleeping, eating, or caring for puppies. Do not look a dog right in the eyes. If a dog knocks you over, roll into a ball, cover your face and stay still. Never run from a dog and never scream around a dog. Before getting a dog, seek the advice of a veterinarian or animal shelter personnel about which dog is right for your family and your lifestyle. Confine your dog in a fenced yard or "dog run" when it is outside. Do not leave your dog on a chain for long periods of time. Chained dogs are more likely to bite. Do not put your dog in situations where it may feel threatened or teased. Follow leash laws. Don't let your dog roam freely. Keep your dog healthy with regular check-ups and a vaccination program tailored to your dog's needs. Make sure your veterinarian vaccinates your dog against rabies with a licensed rabies vaccine. See a veterinarian promptly if your dog is sick or injured. Illness and pain can make a dog more likely to bite. Socialize with your dog so it feels at ease around people and other animals. Train your dog to consistently obey basic commands such as "stay," "sit," and "come."